Your square metal garden table can also be enhanced with a few accessories such as a parasol and seat cushions. Under the section where you select your chairs, you’ll find offers for garden seat cushions and parasols in various colours. If you purchase these accessories with your garden furniture set, you can to save 70% compared to buying them separately. So take the chance to enhance your furniture set at a bargain price! Those aren’t the only available offers. You can get between 20% and 80% off various aluminium patio furniture items such as side tables, benches or sun loungers. But these offers will be unique to this page, so combine them with your main order to take advantage. In general, we have some outstanding deals on our clearance page, too. These standalone deals apply to everything, from side tables to 12 seaters. They change all the time, so check back regularly. We have a couple of models of square garden table for 8 people, made of cast aluminium. As with our other ranges, this is the material of choice for our 8 seater square garden furniture due to its superb weather resistance. If you purchase one of our 8 seater square tables, prepare to do very little. Throw away the sandpaper and varnish you used to need to stop your wooden garden furniture from splitting and rotting. Put away the oil and the furniture covers you bought to stop your cast iron furniture from rusting. Your 8 seater square garden table set (chairs included) can stay outside all year long. It won’t rot or rust, and you don’t have to cover it or treat it with any products. To clean your square garden table and chairs just wipe them over with a clean damp cloth. Cast aluminium is robust, but lightweight. Moving your large square table around will be unexpectedly easy for its size. 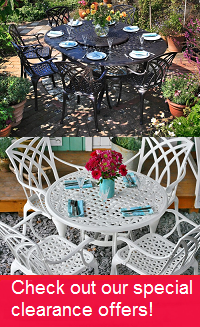 All in all, our aluminium garden furniture sets are the perfect choice. Beautiful, robust, light and virtually maintenance free garden furniture is not a thing of fantasy. We have superb square metal garden tables ready for you to order today. Take a look below. The Tanya table is a white square garden table measuring 162cm. It features beautiful detailed metalwork and can fit a Lazy Susan turntable in its centre. These rotating inserts are a fabulous addition, allowing you and your guests to pass around food and condiments much more easily. The Tanya table also comes in Antique Bronze and can fit a parasol, in case you want to guarantee some shade at your table. We offer free delivery on all of our 8 seater square garden tables. So don’t worry about extra charges appearing on the checkout page. Our aluminium garden furniture sets are delivered as a large package or on a wooden pallet by our partner couriers Parcelforce or Geodis. Both offer online tracking of your order from the day of dispatch. Geodis will also call you the day before delivery to arrange a time slot that works for you. For more details about delivery you can have a look at our delivery information page or give us a call. Once you’ve chosen your square garden table, choose which chairs to pair with it. The April chair will be available at no extra cost, but take a moment to consider the other garden chairs, such as the Rose, Jane or Kate chairs. You can pair one of these other styles of chair with your 10 seater table for between £5 and £25 per chair. These garden chairs are made of the same robust and weather resistant aluminium as the tables. The friendly Lazy Susan team is on hand to take your calls or answer your emails from 08:00 to 18:00 daily. They can provide more information about our garden furniture and respond to any other queries you have. They can also send you fabric and metal samples. These show you the quality of our materials, and can help you choose the colour which best suits your garden. Call us on 01243 717197 or email us at [email protected]. We try to answer emails within 2 hours during office hours. Please show us your new garden furniture to help us raise money for our Do Some Good charity campaign. Just take a few pictures and share them on Facebook or Instagram with the tag @LazySusanFurniture or email them to us. We then donate £10 for any set of photos of Lazy Susan metal furniture in your garden. We’ll donate £20 for photos including friends and family during a family lunch or BBQ. Your help goes a long way.